they operate in the air (like Johnny Cloud, Navajo Ace), the sea (like Captain Storm) or on the ground (like Sgt. Fury), they're usually just guys doing a job, and any innovativeness they may or may not possess is developed by more subtle means. A notable exception is DC Comics' long-running series, The Haunted Tank. The idea behind The Haunted Tank was to have the ghost of a warrior out of history return to act as protector and advisor to a latter-day namesake. Of course, no idea is completely new, and a similar one had been used in the 1940s, for the contemporary superhero Fighting Yank. But when writer/editor Robert Kanigher (Viking Prince, Trigger Twins) and artist Russ Heath (Marvel Boy, Sea Devils) introduced Sgt. Jeb Stuart and his supernatural advisor, General J.E.B. Stuart, in G.I. Combat #87 (April-May, 1961), it wasn't quite like anything else in comics. The long-deceased Confederate general had been sent by the spirit of Alexander the Great to guard over the living sergeant, who commanded a tank in North Africa during World War II. J.E.B. didn't care much for the assignment at first, but became reconciled to it when Jeb honored him by fighting under the flag of the Confederacy rather than that of the Union. Jeb was the only one who could see or hear J.E.B., but (unlike most sole contacts of spirits in fiction of all types) made no secret of the fact. His crew thought he was nuts, but went along with the gag because as crazy as he seemed to be, he did know what he was doing (or at least had good advice) when it came to fighting the enemy. The Haunted Tank was a hit with readers, and continued in G.I. Combat for a very long time, usually as the cover feature (tho it didn't have any spin-offs into other media). In fact, it was second only to Sgt. Rock as DC's longest-running war series. 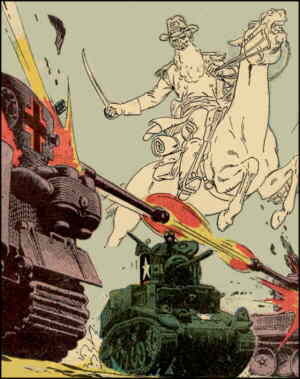 It also introduced another long-running DC war series, The Losers. Various writers and artists handled The Haunted Tank over the years, including Bob Haney (Metamorpho), Jerry Grandenetti (Prez), Joe Kubert (Hawkman) and other regulars in the DC war comics line. It ended only when the title itself did, with its 288th issue (March, 1987).